Check back, as we will be adding more activities as we hear about them! If you know of an event or activity, email us at contact@enjoyutah.org . View the weather report HERE. Get to know your city cemetery! Join Sir Topham Hat and Thomas The Train aboard the Heber Valley Railroad! This is so cool, it makes me want to drive down to Moab just for this event! This looks like a BLAST! Going on all weekend long. Visit our Family Vacation Series page for ideas of where to camp and vacation! At STRIDERS, we think what they're doing at NO MORE VICTIMS is a pretty big deal and we wanted to help. ALL the proceeds from the Memorial Day Classic event in Syracuse will directly benefit kids who are victims of sexual abuse. Thanks for the help and your support. Visitors will be led on a short, easy hike on the Parade Of Rock Art Trail. Meet at the visitors center on Monday May 30th at 1pm. Camp Floyd in Utah County is holding a Civil War re-enactment with many other activities all weekend. original ceremony was held over 130 years ago on May 10, 1869. The Heritage Day Celebration includes a tour of many of the town’s charming pioneer-era homes and buildings, built along Main Street and throughout the town. Tickets for the home tours cost $10 for adults and $5 for children, and are sold at the Old Spring City School and the Old Firehouse, and funds benefit preservation and restoration efforts in Spring City. There are many good movies out, and Memorial Weekend marks the beginning of the summer movie season. Catch a movie at a theater near you! Lots of events and activities planned. Tooele. FREE Admission! Memorial Weekend in Moab. View a list of local community events, thanks to Marsha Maxwell with About SLC! The 8th Annual Park City Film Music Festival begins Friday, May 20 and runs through May 30 (Memorial Day). The Film Music Festival screens independent films at three major venues - the Library and Education Center, the Egyptian Theatre on Main Street and the Propector Theatre. Start this summer season with an old fashioned pig roast and poolside party benefiting the People's Health Clinic. Enjoy all the fixin's of a traditional barbeque including our award winning Spruce burgers and delectable desserts. Also, enjoy the sounds of the 6 member Mister Pickens Band with their "classic country twist of honky-tonk and blues." Iosepa Ghost Town in Tooele County usually has a big Memorial Day celebration, but I cannot find any information on it this year! If you know info about it, please email me at contact@enjoyutah.org. Thanks! I will keep looking and post when I find it! ...The Veterans of Foreign Wars, Harris Carter Chapter of Tooele will hold their annual Buddy Poppy Drive for donations during Memorial Day weekend from May 27-30. We shall be primarily located at Wal-Mart on May 27 and 28 passing out Buddy Poppies for donations. If any local merchants would like for the Ladies of the Auxiliary to pass our Buddy Poppies for donations at their storefront location please contact us in advance by May 26. Point of contact is Josephine Garcia at 882-0169 or Yvonne Edwards at 830-5923. Celebrate the morning of Memorial Day, May 30 at 9 a.m. and the start of the summer season with a fast, flat and fun 5K. There will be great prizes, awards and all participants will receive a technical race shirt. There will have a drawing for all registered runners at the end of the race. Awards to top three overall male and female runners (will be excluded from age group categories if in overall top three). The race starts at the Benson Grist Mill, 325 State Road 138, Stansbury Park. Cost: $15 per person, $50 for family of up to 5, and $10 for additional family members (Immediate family only). Online registrants will be charged a $1 processing fee. Race day registration: 8-8:30 a.m. Pre-registration online at www.bensonmill5k.com or at Premier Athletics, 14 North Main Street Tooele (435) 882-0664. 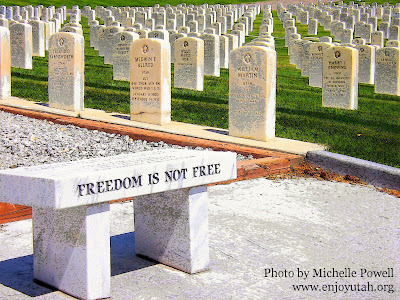 Tooele Elks Lodge #1673 will be hosting a Memorial Day service at Veteran’s Memorial Park on Monday, May 30 at 11 a.m. Commander King from Dugway Proving Ground will be our guest speaker.